Gantt charts are useful for displaying the duration of events or activities over time. In a Gantt Bar Chart, each separate mark (usually a bar) shows a duration. For example, you could use a Gantt chart to display average delivery time for a range of products. For more information about Gantt bar mark type, see Gantt Bar Mark. The following exercise walks you through using Gantt charts to show how many days, on average, elapse between order date and ship date. The data is broken out by product category and ship mode. The view displays results on a weekly basis for a three-month period. The date is automatically aggregated by year, and column headers are created with labels showing the years in your data. Drag Category and Ship Mode dimensions to the Rows shelf, dropping Ship Mode to the right of Category. Now we want to size the marks according to the length of the interval between the order date and the ship date. But there are no measures that we can use to capture that interval. However, we can create such a measure by creating a calculated field. This opens the Calculated Field dialog box. This option is also available from the Analysis menu. Name your calculated field OrderUntilShip. Clear any content that may be in the Formula box by default. This creates a custom measure that captures the difference between the Order Date and Ship Date values, in days. Drag the OrderUntilShip measure to Size on the Marks card. 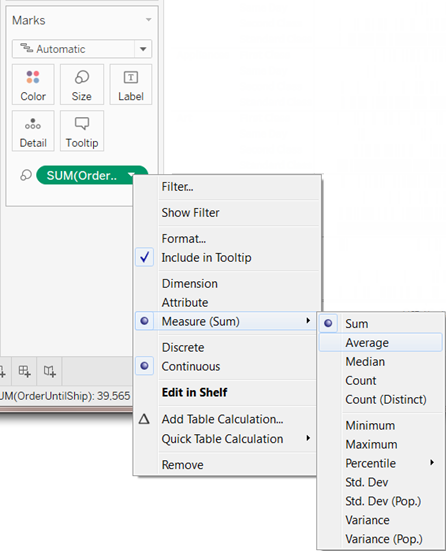 The default aggregation for OrderUntilShip is Sum. But we're not interested in adding all the intervals—it makes more sense to average them. We can make our data more readable by filtering down to a smaller time window. 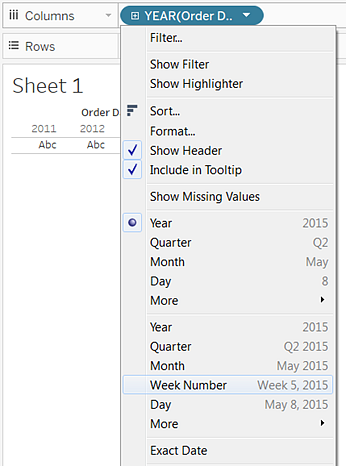 Hold down the Ctrl key and drag the Week(Order Date) field from the Columns shelf to the Filter shelf. By holding down the Ctrl key, you tell Tableau that you want to copy the field to the new location, with whatever customizations you have added, without removing it from the old location. Set the range to a three-month time interval, such as 1/1/2012 to 3/31/2012, and the click OK. It can be difficult to get the exact date using the sliders—it's easier just to type the numbers you want directly into the date boxes. Which ship modes are more prone to longer lag times? Do lag times vary by category? Are lag times consistent over time? 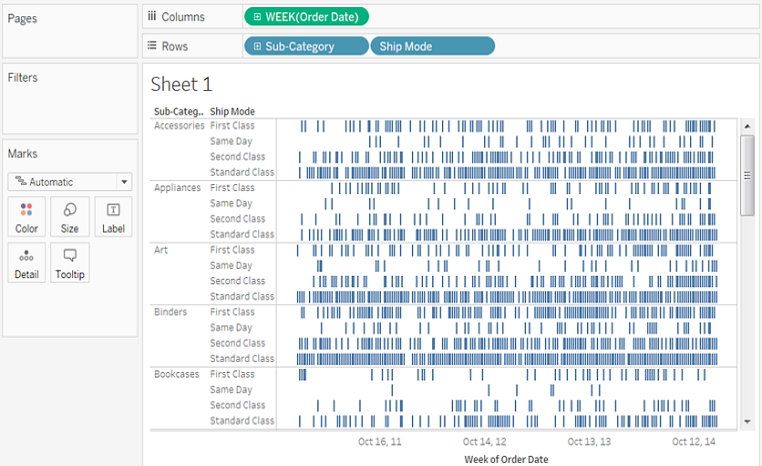 If you publish this view to Tableau Server, you can include Quick Filters that let users interact with the view by varying the time window, or filtering out various categories or ship modes. For more information, see Publishing Workbooks.